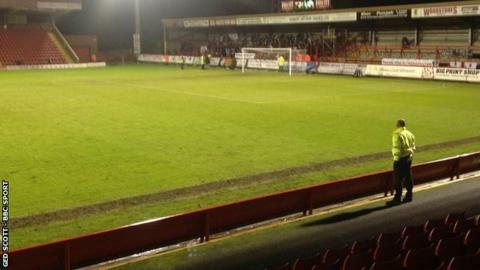 Kidderminster Harriers climbed to within two points of the play-offs with only their second win in five matches. Harriers led on 14 minutes with a fierce, low 20-yard shot from Jared Hodgkiss, his first goal for the club. They then scored a freakish second just before the break, claimed by Chey Dunkley, after the ball ricocheted in. Harry Beautyman fired in a right-foot shot on 53 minutes to pull one back. But Harriers hung on to inflict a first defeat in six games on the Kent side. Bulls fans were handed the stage provided by the presence of the live TV cameras at Aggborough to demonstrate their anger towards former owner Tommy Agombar, who they say still runs the fallen club despite being under an FA ban. They chanted, almost constantly, "We want Tommy Out".Hereford, who remain in danger of being wound up at the Royal Courts of Justice later this month, were expelled from the Conference in June for non-payment of debts and are now struggling in the Southern League. The downside for hard-up Harriers was attracting a gate of just 1,560 to Aggborough - their second lowest crowd of the Conference campaign to date. In fact, the hosts were spared from suffering their lowest crowd of the season by the noisy presence of 200 fans from neighbours Hereford United, invited by Harriers to protest at the way their club is being run. Gary Whild's Harriers are now up a place to ninth in the table, while Welling, for whom top scorer Beautyman has now hit eight goals this season, remain 17th, just a point clear of trouble. Dunkley's goal was his fourth of the season, further supplementing the Harriers defender's current status as the club's top scorer. "We were not at our best and we've had a bit of luck, but there's times already this season when we've played better and not got anything. "We could have done with the third goal to help us relax a bit, but we kept our heads and saw it through. "Getting the three points was the main thing. It keeps us in there ticking over." Match ends, Kidderminster Harriers 2, Welling United 1. Second Half ends, Kidderminster Harriers 2, Welling United 1. Attempt missed. Harry Beautyman (Welling United) right footed shot from the right side of the box is too high. Foul by Nathan Blissett (Kidderminster Harriers). Jamie Day (Welling United) wins a free kick. Foul by Jamie Day (Welling United). Attempt saved. Aristide Bassele (Welling United) right footed shot from the centre of the box is saved. Assisted by Harry Beautyman. Hand ball by Nathan Blissett (Kidderminster Harriers). Substitution, Welling United. Malachi Hudson replaces Zac Fagan. Foul by Cheyenne Dunkley (Kidderminster Harriers). Foul by Callum Gittings (Kidderminster Harriers). Foul by Ben Jefford (Welling United). Nathan Blissett (Kidderminster Harriers) wins a free kick. Attempt missed. Nathan Blissett (Kidderminster Harriers) header from the centre of the box misses to the left. Assisted by Kevin Nicholson. Attempt missed. Jamie Day (Welling United) left footed shot from outside the box misses to the right. Assisted by Harry Beautyman. Attempt saved. Craig Reid (Kidderminster Harriers) header from the centre of the box is saved. Assisted by Kevin Nicholson with a cross. Tyrone Marsh (Welling United) wins a free kick. Substitution, Kidderminster Harriers. Nathan Blissett replaces Michael Gash. Offside, Welling United. Joe Healy tries a through ball, but Joe Healy is caught offside. Substitution, Kidderminster Harriers. Callum Gittings replaces Aman Verma.